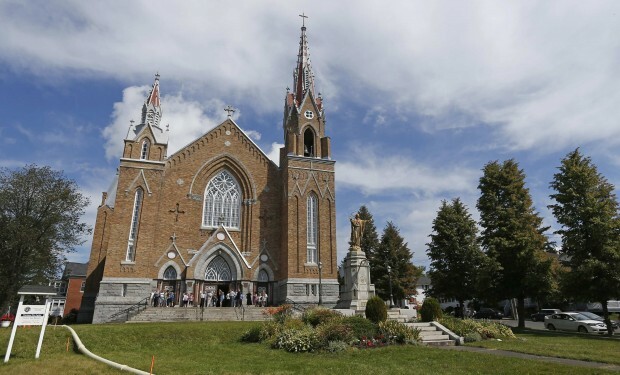 OTTAWA, Ontario (CNS) — A Catholic church in Quebec has opened its doors as a place where people can leave pictures of loved ones, flowers and candles in memory of victims of a derailed train whose exploding cars left about 50 dead. When the runaway train barreled into Lac-Megantic July 6, firefighters told Fathers Steve Lemay and Valentin Malundama to get out of the Sainte-Agnes Catholic Church rectory. The two escaped, and the derailed train’s tanker cars full of crude oil exploded and incinerated much of the downtown. Services have been taking place in other Catholic churches that are under the pastoral care of the two priests, but on July 14, about 200 people attended Mass at Sainte-Agnes for the first time since the disaster. For Father Lemay, the Gospel reading on the good Samaritan struck a chord because of the way people in the community have been responding to each other’s needs. The blaze also left about 200 people homeless, and messages of support and prayers have poured in from across Canada. Priests from other areas have traveled to Lac-Megantic to give Fathers Lemay and Malundama a chance to get some sleep. Lay Catholics from the community have also stepped up to help. Father Lemay said other offers have come in but, until housing is found for those displaced by the fire, accommodating more help from outside is not feasible. He said the population of Lac-Megantic is overwhelmingly Catholic, and the tightly knit community has responded with generosity and kindness. “Everybody is helping other people and receiving help from other people,” Father Lemay said. “It’s beautiful to see this moment. By mid-July, there had been no funerals as families awaited official information about the deceased. A memorial Mass has been scheduled at Sainte-Agnes July 27.